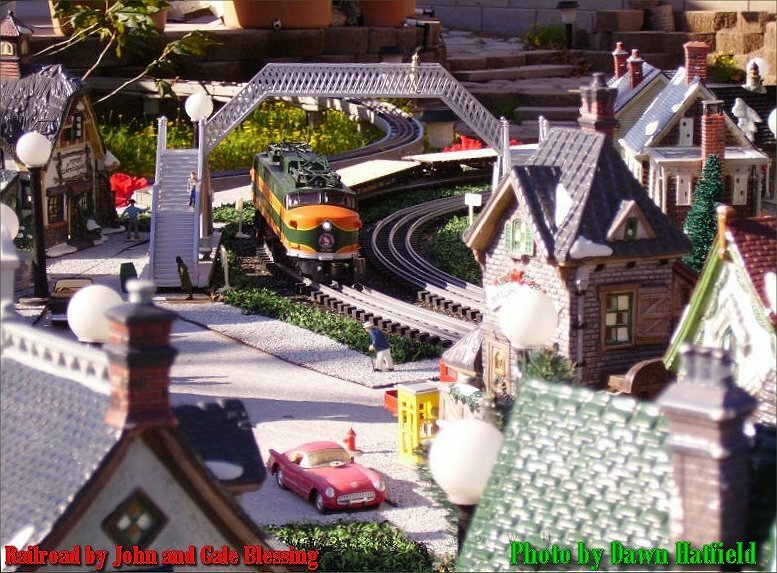 What happens when you combine collectible villages with toy or model trains? - O gauge trains (such as those made by Lionel®) have been around for over 100 years. 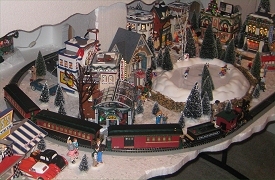 Christmas display villages, such as those made by Department 56 have been around since about 1976. Both represent hobbies in their own rights, with many magazines, web sites, clubs, and other resources serving their respective hobbyists. This web page is about what happens when the two hobbies converge - when collectible display villages (such as those from Dept. 56®, Lemax®, or Hawthorne Village®) are being "served" by toy or model trains. As a garden railroader myself, I usually model in larger scales that are suited for backyard railroads. 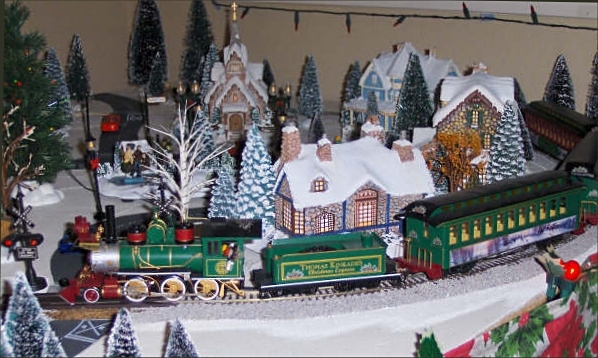 But since I established the Big Christmas Trains™ web site in the fall of 2004, I began to realize just how many people were combining holiday display villages with toy or model trains. The advantage is that this combination of hobbies gives you literally thousands of choices for what to buy and how to do things. The disadvantage is that the two hobbies have two distinct cultures (you could almost stay that most model railroaders are from Mars and most display village collectors are from Venus), and few resources are available for people who want to do both at the same time. 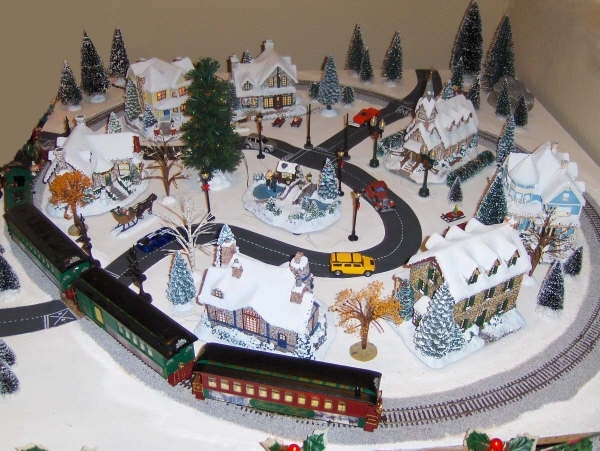 This page has been started to help you sort through the choices you face when you start planning some sort of indoor display railroad and village, whether it will only be set out during the holidays, or whether you want to have it available all year long. It is meant to help you borrow ideas from both the collectible village and the model railroad hobbies to create something that meets your specific needs. On30 trains are about the same size as Lionel® trains, but run on the same kind of track as HO trains. These trains are mostly made by Bachmann, a very large model railroad manufacturer. They are available painted for either holiday or for year-round use. Many beautiful collectible versions of these trains are also available from Hawthorne Village®. They tend to be very realistic models, which to my mind makes them very well suited to serving collectible display villages, which tend to have excellent details. They also fit in a slightly smaller space (about 38") than O-gauge or O-27 trains. Traditional O-gauge or O-27 trains of the sort made by Lionel® and K-Line®. These trains run on 3-rail track and have been around for a century. They tend to be very solid, but some of them look more like toys than models. O-gauge trains got a boost in 2004 by Lionel's issue of the Polar Express™ train, a very charming and fairly realistic-looking train that can run on a 40" circle of track if it needs to. If you have something else on hand already, by all means, try it out and see how it works out for you. But if you are looking to make a new purchase, think about On30 trains (my first choice for display villages) or O-gauge or O-27 trains. Note: Don't let the fact that some Lionel® trains are described as O gauge and others are described as O-27 bother you The main difference between the two is the kind of track they run on, and if you use the track that comes with your train set you won't encounter any difficulties. The good news is that whichever kind of trains you choose to run, you will have no trouble finding buildings, figures, and accessories to create the community (or communities) that your trains will serve. Just as you have many choices of trains, you have even more choices of buildings and accessories you can use to create your communities. Putz Houses - The original Christmas village houses came from Japan and were made from pasteboard. They were called putz houses because the German-Americans who built large communities around their train sets, trees, or nativities called them "putzes" (related to our word for "putter," because you "putter around" with the houses and accessories until you like the way they look). Our articles on collecting and building "glitterhouses" describe the growing hobby of using antique or reproduction putz houses in your displays. The best part about this variety is that you can choose the best of both worlds. You can always start out with a "display" featuring mostly collectible pieces and pick up some modeling and railroading skills as your miniature world expands. Or if you have been a model railroader all your life and now you want your railroad to look like it belongs to a more specific place and time, you may take advantage of all that the "collectible" pieces manufacturers have to offer - in many cases they're more reasonable in price than you might think. In addition to your choices of trains, buildings, and accessories, you have many options for how you will put your railroad together. 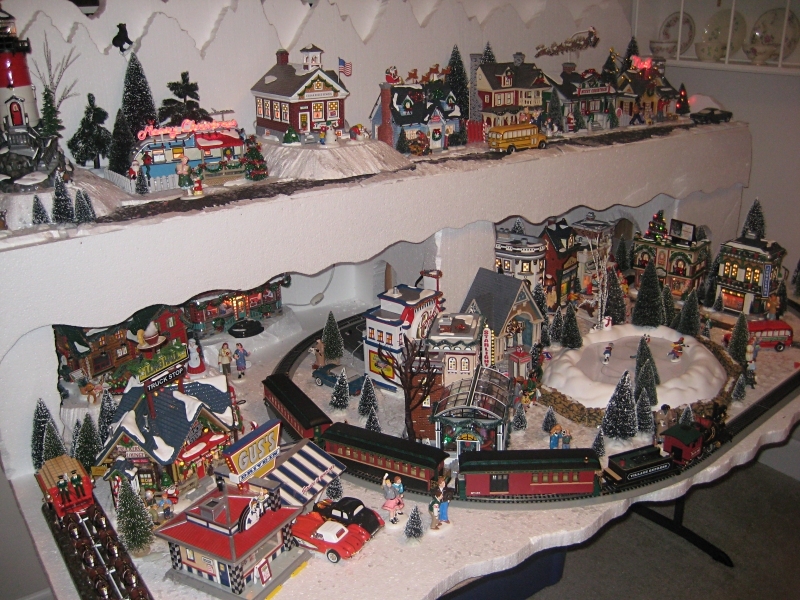 Many people who only combine their trains and towns at the holidays, use white sheets over table or some such to create a completely temporary railroad. 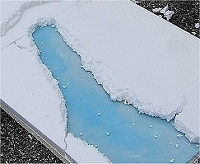 Others use Styrofoam panels, creating a "snowy-looking" base for their railroads that can easily be carved into interesting shapes and stored away off-season. Still others have gone to setting up permanent or semi-permanent railroads that can be use year-round. Once you start building that sort of railroad, you'll find that many "tips and tricks" model railroaders use apply to your projects as well. In other words, your train-and-town setup can be as simple or as elaborate as you want. However you decide to approach this hobby, and however you put your trains and towns together, you will find a wealth of rewarding opportunities for fun!